"Reunion - Part 1 of 2"
Martha Kent staggers out of the Kent home, both of them aflame. Jonathan runs after her, when he's met by Kara in Amazonian armor with a raised sword. She tells him he's weak and foolish, like all men, and that he's been out of his depth since the day Kal landed on earth. And then she presumably beheads him, just as he snaps awake in bed. He heads to the kitchen for some water and meets Kara, who calls him "Uncle Jonathan" as her eyes glow red. She confides in him about her mistake with Air Force One last issue, and then we cut to Una and Karate Kid, who are stowing away aboard a train to travel more stealthily. Karate Kid has a terminal illness, it seems, and they're on their way to try to find a cure from Buddy Blank. Equus calls the police and tells them a train is about to derail and there will be a viral infection, and the sherriff's men need to shoot to kill. He then hands up and derails the train himself. Kara is still talking over what happened with Jonathan and Martha, and she is afraid of Kal being ashamed of her. They try to console her by telling her Clark's made mistakes in the past too (with a nod to the "King of the World" storyline from way back when), as Kara gets a call from Wonder Girl at Titans Tower about the train derailment... they know of a bio-weapon threat and Kara is the closest. Karate Kid and Una emerge from the wreckage of the train as the police arrive and open fire. Just as Karate Kid dispatches the police, Kara arrives, swoops him up and dumps him face-first back to the ground. Equus is talking to Orr, who tells him the mission is unauthorized and Equus says he no longer works for Orr and tosses the phone away. Karate Kid attacks Kara, which proves fruitless. But mere moments later Kara remembers Karate Kid and Triplicate Girl from her time with the Legion, which she has apparently forgotten about until just that moment, and then passes out (Karate Kid surmising it's because her mind was overwhelmed). Then one of the train cars comes crashing down out of the sky and flattens the prone Kara, and Equus stands holding another car over his head, ready to strike. Let me tell you up front that I've not been following Countdown. To those of you that have, this issue may make more sense. As a stand-alone book, it's like trying to navigate a labyrinth. And may I just say that seeing Equus and Orr again was misery on paper. If I never see them again, GOOD. Why do we need to be reminded of the misery that was "For Tomorrow"? Why don't you give me a nice paper cut and pour lemon juice on it while you're at it? Within the framework of this issue on its own, Jonathan's dream seemed to have no point. He may be worried about Kara's true allegiance, but that never comes up while he's talking to her later... not even with a silent, worried glance, or feelings of guilt over not trusting her implicitly. I'm not sure exactly why it was there, hopefully it will tie in to part 2 of the story. I also don't get why Kara is suddenly calling him "Uncle Jonathan" when, to the best of my recollection, she's barely even spoken to the Kents before (unless this happened in Countdown). And if she does consider them to be like an aunt and uncle to her, and she goes to them seeking comfort and trustworthy people to talk to, why would she show up in the dark with her eyes glowing red? Sure, it makes for a dramatic bottom panel to page 3, but so what? But apparently page 3 needs a dramatic end-panel cliffhanger that doesn't tie into anything on the following page or the rest of the book! I don't know what's up with there being two Legions. I don't know why Karate Kid has a virus, I don't know what it is, I don't know why we need to see them stowing away on a train. I'm guessing this is all part of the "Countdown tie-in!" which equates to "Stand-alone doesn't work!" Woe to us who aren't reading Countdown, apparently. I don't know why Equus is after Karate Kid and Una. Or why he'd call the police to do something he was already planning to do himself, and was certainly more than capable of. "I'm gonna squash these alterna-Legion types, but I'll call the cops and tell them to shoot them on site just in case I fail miserably!" And then... THEN! The cops, acting on an anonymous tip... show up at the train derailment and immediately OPEN FIRE on Karate Kid and Una when they recognize them as metahumans. Karate Kid's utter uselessness against Kara was amusing, as was her offhanded dispatching of him. Perhaps the one truly interesting thing to come of this issue is that we learn Kara's somehow forgotten about her time with the Legion, and when she recognizes Karate Kid and Una as Karate Kid and Triplicate Girl from the Legion *she* was with, she can't handle it and passes out. Got all that? If this wasn't a tie-in, I'd rate it lower. If I'd read what it's tying into, I could rate it as part of that story. But I haven't, so I can't. Rating this issue on its own, there's some good stuff that's detracted from by Orr and Equus and a whole mess of confusion. All I can do is call it a 3 and hope the tie-ins stop soon, wot. Art - 5: Well, Mr. Guedes sure knows how to grab you. The first page splash of Jonathan running after a Martha Kent who is engulfed in flames? I think my eyes popped out of my head. One of them rolled under the desk. I still haven't found it. It's sad a lot of his art had to be wasted on Equus, but the Kara/Karate Kid fight was spectacular in execution. Cover Art - 4: You're an insanely powerful Kryptonian being attacked by someone who's only offense is martial arts moves backed by mortal strength. The interior of the book clearly shows Karate Kid can't remotely hope to win that fight. So what's a Kryptonian to do to defend herself? Rip an engine out of a car to smash him with, DUH. That extreme oddity aside, the art here is pretty nice. 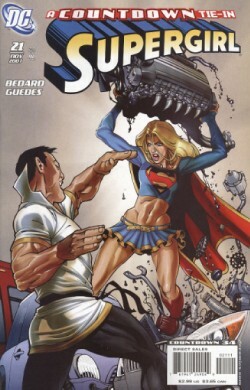 In fact I'd have given it a 5 had Kara's skirt not once again been reduced to a glorified loincloth. Any lower they'd have had to solicit this in the adult version of "Previews". Ugh. But hey, I'm sure it made all the teen fanboys happy, right? Too bad that her costume on the interior is now respectable! She sure fooled YOU, teen fanboys!